I missed using the Exobalance Hair Regrowth Solution for three days, will it hurt my progress? Are there any significant side effects with Exobalance Hair Regrowth Solution products? What is the Exobalance Hair Regrowth Solution? Does Exobalance Hair Regrowth Solution have Minoxidil in it? How long has this product been on the market? I'm not really losing my hair, but I am interested in getting thicker hair, can Exobalance Hair Regrowth Solution help me? I've lost most of my hair; can your product help me? Will I grow hair on any other part of my body? Will Exobalance Hair Regrowth Solution effect with any of my medications or vitamins? What will happen if I stop using the Exobalance Hair Regrowth Solution will I lose my hair and how soon? I'm losing my eyebrows, can your product help? If so, would I apply it the same way as I would for my scalp? Is Exobalance Hair Regrowth Solution effective on all types of hair? My hair loss was caused by a bad perm/dye or hair straightening system. Can your product help me? Can I continue to perm/dye or straighten my hair? Will this affect my Hair Color? Can I use my own hair styling products (conditioners, hot oil treatments, gel, mousse, hair spray)? I've just gotten out of the shower, what should I do? My hair is extremely dry and brittle, will Exobalance Hair Regrowth Solution help me? What if I exercise and my scalp perspires? Can people with psoriasis or any other skin conditions use Exobalance Hair Regrowth Solution? It shouldn't hurt your overall success. However, keep in mind that frequently skipping the application will interfere with your progress. There are no common major side effects with our product, Exobalance Hair Regrowth Solution. Exobalance Hair Regrowth Solution is an all natural product. Please be sure to always consult with your physician before deciding to embark in treatments or remedies of any kind. The Food and Drug Administration has identified the natural body chemical called Dihydrotestosterone (DHT) as a main cause of hair loss. This chemical is produced from testosterone and appears to act as a signal to hair follicles to stop producing hair and begins to cause the slow degeneration of the hair follicle. Exobalance Hair Regrowth Solution is an all-natural product that uses nature's most powerful ingredients that have been scientifically proven to stop hair loss and stimulate hair re-growth in men and women. The break through technology strengthens the scalp to fight off hair loss. Hair loss occurs in two different ways, one is a trauma in our life, like an illness, disease, aging or hormonal imbalance. The other is our scalp is attacked by an outside source, like UV light, pollutants, drying and cosmetics. Four steps are needed to reverse hair loss, the scalp needs to be cleansed, (opening up the hair follicles and bring back natural flora), bring back circulation to the scalp (blood flow is essential for hair growth), drench the scalp with vital nutrients, and add moisture to the scalp. To combine these four unique parts into one I have come up with the product Balance with Vitaliste â„¢ , to naturally bring back into balance your scalp and restore your hair. No, we do not use Minoxidil in our product it is steroid and drug free. This product is Patent Pending, meaning that it has been filed with the Patent office but has not yet been approved. Since normal hair usually grows only 1/2 to 1 inch per month, Exobalance Hair Regrowth Solution also takes time. Results may be seen as early as 2 months with twice daily use. For some people, it may take at least 4 months for results to be seen. If you do not see any results after 4 months, stop using and consult your doctor. 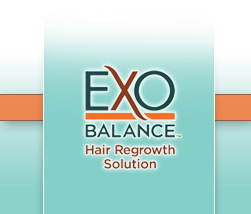 Exobalance Hair Regrowth Solution was launched in January 2010. This new technology is very unique and approaches hair loss in a totally new way. Yes, it can thicken your hair. The Exobalance Hair Regrowth Solution promotes a healthier, thicker follicle (root), increasing the volume of each hair. Our product does not just promote the growth of healthier and thicker pre-existing hair; it stimulates the re-growth of stronger natural new hair in affected areas. The only way to know for sure is to try it. Our product works on the majority of its users. We recommend you use Exobalance Hair Regrowth Solution for at least 1 Full Year in order to give yourself a chance for it to work. Generally, our formula will grow hair on the scalp where it has been directly applied regularly. On rare occasions, however, hair growth in other body areas (i.e., face, arms, back) has been reported. If you have any questions regarding prescription medications or any dietary supplements, we strongly urge you to consult your physician. Continued use of our Exobalance Hair Regrowth Solution is needed to maintain hair regrowth. Once you achieve the amount of hair you like we recommend a maintenance dose of 2 to 3 times a week to maintain your level of hair. The length of time before your hair regresses to the way it was before using our Exobalance Hair Regrowth Solution varies with each individual. Since normal hair usually grows only 1/2 to 1 inch per month, hair regrowth with Exobalance Hair Regrowth Solution also takes time. 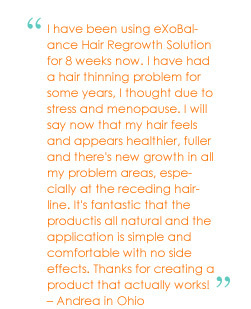 Exobalance Hair Regrowth Solution has had a very good success rate and we have many satisfied customers. 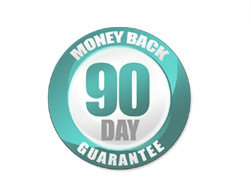 We suggest you try it, if you are not satisfied for any reason, just send the products back for a refund within the stated guarantee time period (less shipping and handling) stipulated on the guarantee page. No. The Exobalance Hair Regrowth Solution is recommended for use ONLY on the scalp. Yes. The mechanism for hair regrowth is the same in humans regardless of race. The Exobalance Hair Regrowth Solution can help you grow back healthy hair. Exobalance Hair Regrowth Solution does not affect bleaching, perming or straightening of the hair. It is a water soluble solution that does not effect chemical processing. Yes, Exobalance Hair Regrowth Solution is water soluble and does not affect these processes. No, the formulation was designed to absorb into the scalp and not affect hair color. The formulation does not have any sulfates in them. First, towel-dry your hair well - particularly the areas that are thinning or balding. Apply Exobalance Hair Regrowth Solution directly to the scalp. Then, massage the solution into the scalp for approximately 15 -30 seconds as outlined in the instructions section. Yes, one of the four steps in Exobalance Hair Regrowth Solution is replenishing moisture to the scalp. Over time as the scalp comes back to its natural state, you will see more sebum production this will increase moisture to the scalp. The Exobalance Hair Regrowth Solution is applied twice a day, once in the morning and once in the evening. If you are planning on heavy exercise, it is recommended that you apply the solution after your workout to a clean scalp. If you are exercising in the evening and have applied the Exobalance Hair Regrowth Solution in the morning, you need not worry. The Exobalance Hair Regrowth Solution was absorbed when it was applied in the morning and the benefits will not be lost through scalp perspiration after several hours. If you are dissatisfied with Exobalance Hair Regrowth Solution products for any reason, simply return the unused portion for a refund within the allocated time frame (90 days) of the warranty (less shipping and handling). For more information, please refer to the instructions outlined in the guarantee page. Please be sure to always consult with your physician before deciding to embark in treatments or remedies of any kind.